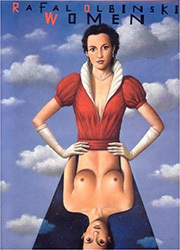 At once both controversial and classical, Rafal Olbinski has built a career around examining the mystery of women. His paintings depict a woman who is both distant and effortlessly available. In this first publication of his paintings, Olbinski creates a world that seeks to celebrate the secrets of women without destroying their mystery. Born in post-war Poland, Olbinski built a successful career as a poster artist and graphic designer in Europe before immigrating to the United States in the early 1980's. Best known for his depictions of women, this book explores Olbinski's unique perspective on such classical figures as Salome and Da Vinci's Mona Lisa , to contemporary women and their place in today's world.